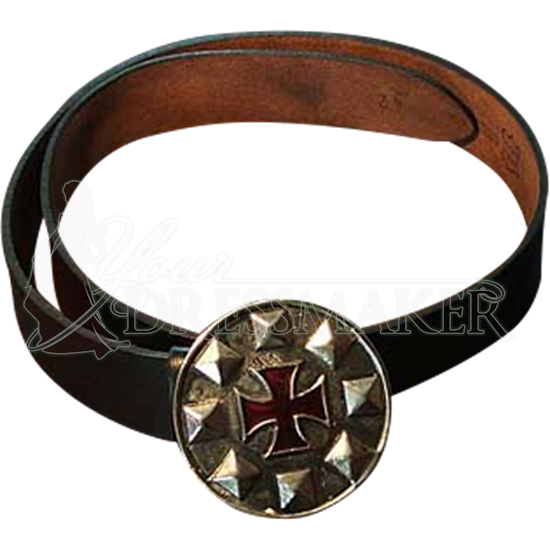 The Crusaders Cross Buckle Belt is a simple yet attractive belt and belt-buckle combination that can add just the right knightly touch to virtually any look or style. It is great not only for modern looks but also for knightly and historical ones. This attractive combination consists of a simple leather belt that includes an attractive belt buckle. The buckle is circular in shape and features an outline of pyramidal studs, surrounding the interior design, which consists of a bold, broad-armed red cross. The metal buckle is colored to look like faded brass, and is an attractive complement to be worn around the waist. This simple yet stylish buckle belt is available in only one color, but comes in four sizes. In order to ensure a proper fit, order your belt according to your waist size. 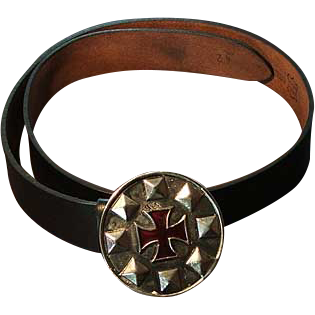 The Crusaders Cross Buckle Belt is a great gift to give to any crusader aficionado. It is a striking combination of modern aesthetic mixed with antiquated symbolism that can be worn on a daily basis, whether you are in-costume or not.